Wrong answer to a question in the iPhone app, AtMyPace:Statistics. Our central city is being “deconstructed”. That’s the modern word for demolition. 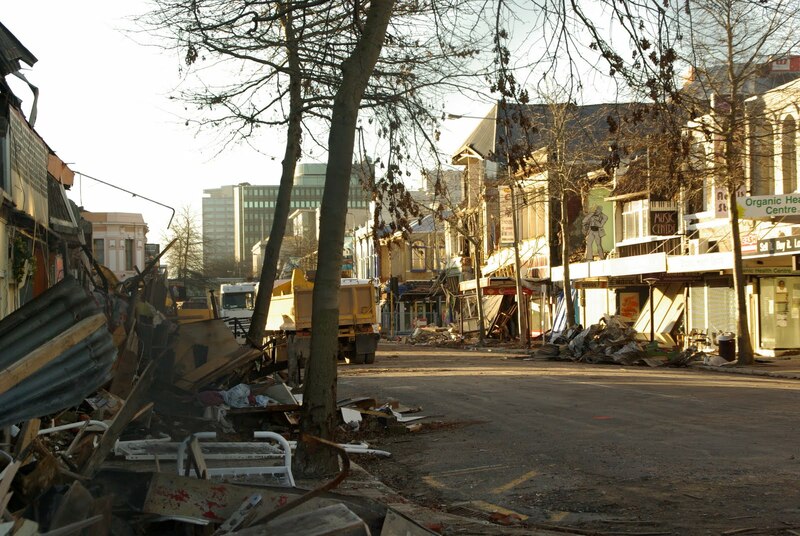 We live in Christchurch, New Zealand where many of our buildings were badly damaged by a string of serious earthquakes over the last 18 months, beginning on 4 September 2010. Over a thousand buildings in the central city are being demolished, because they are no longer safe. The larger ones will take up to a year to bring down, and experts have come from other parts of the world to assist in the process. It is pretty sad, really as we love our buildings. But we need to build new buildings, based on the knowledge we have gained on the geology of Christchurch. We cannot build new, strong buildings until the old ones are removed. And even some of the buildings which are structurally sound cannot yet be occupied because of danger from an adjacent unstable building. They call the process deconstruction these days. The word deconstruction seems rather twee to me, and reminds me of feminist scholarship and words like “epistemology” and “discourse”. I presume it implies a surgical removal of parts of the building rather than whacking at it with a big metal ball. Either way, the bad stuff has to go. When we are teaching, we endeavor to remove wrong ideas before we try to replace them with correct ideas. Interesting side thought – is there room for the wrecking-ball approach at times in teaching, or does that result in too much collateral damage? Lets’s go for gentle removal for now. Let’s take the example of Sampling Error. Anyone with half a brain can see that the words tell us that sampling error is a mistake you make when sampling. Or at least it is caused by a bad sample. Well unfortunately, as you can read in a previous post, Sampling Error Isn’t, the half-brained person is wrong. The term is misleading. But enduring. Unless the initial wrong idea is removed, like a broken building, the learner will not accommodate the new idea. Actually maybe wrong ideas are more like weeds that pop up again if you don’t get them out at the roots. Sometimes we need to repeatedly remove wrong ideas. The constructivist view of learning proposes that we build knowledge on our prior experiences and knowledge. Some times construction, like in Christchurch, involves preparatory deconstruction. We have discovered a quick and effective way to work with this idea. It has not been scientifically tested but passes the ISTW criterion. (It Seems To Work). 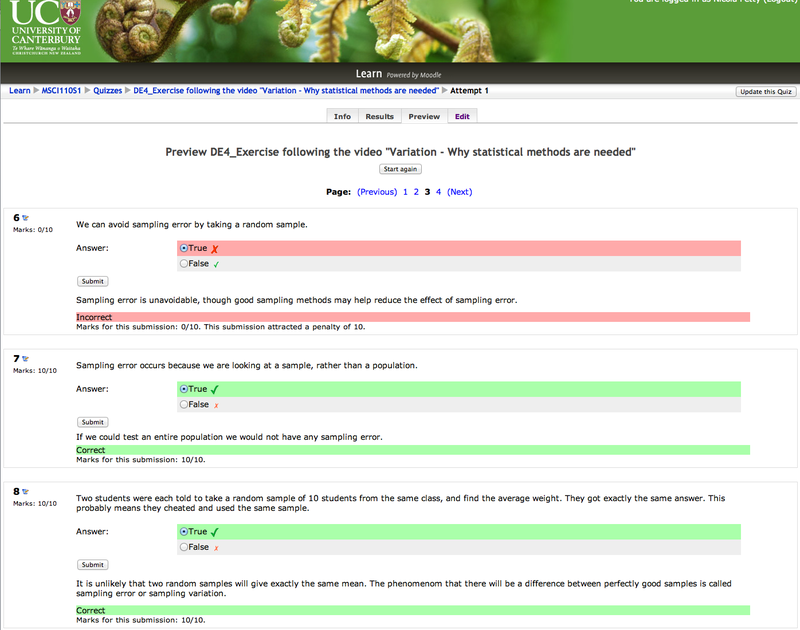 Using the Learning Management System we provide short true/false quizzes. These are more activities than tests. The questions proceed systematically through concepts, and address possible misconceptions as statements for the students to decide are true or false, before presenting correct ideas in the feedback. The feedback is rather like notes in a textbook, but the students engage with the idea through the question, before being presented with the correct concept. Part of the ISTW evidence is that students are not required to do these tests, but choose to take them, often three times or more, generally until they get 100% in them. 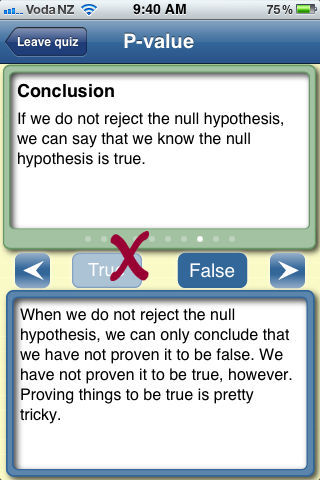 Feedback after wrong answer to a question in the iPhone app, AtMyPace:Statistics. We’d love some feedback on this approach. If you’d like a promocode for AtMyPace: Statistics, which is now available on iPhone, iPod touch and Ipad, contact me through the AtMyPace Facebook page. Leave comments here or there! Or to @Rogonic on Twitter.